A recent study by CareerBuilder found that almost eight out of 10 American workers say they live paycheck to paycheck to make ends meet.1 Whether you’re supporting a family or just getting started in your career, a few extra dollars can make a big difference. But given the current state of the economy, that cash might not come from your typical sources. The “e-conomy” as some call it has introduced a number of digital platforms that connect individuals with non-traditional earning opportunities. Today we’ll cover a few applications that focus on transportation as a means for extra income. Have a car of your own? How about a parking spot? Sharing those resources is not only good for the environment, it can also help you make a bit of extra cash to put toward goals and savings. 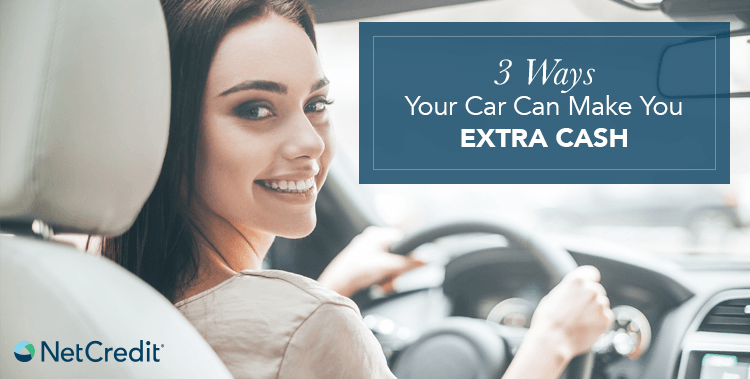 There are several ways your car can help you make extra income to meet those needs. Let’s get started with some of the most familiar platforms in the game. Ads for on-demand carsharing app Lyft entice viewers to make money and “have fun driving your own car.” Lyft and Uber drivers are matched with passengers who use the app to request rides. Each company has its own requirements (age, driving experience, vehicle restrictions, etc.) and they can vary by the area you’re driving in, so check with each to see if you’re eligible. If you are, the onboarding process is quick and easy — but that’s not even the best part. Unlike your typical job, you get to choose when you drive: nights, weekends, one random hour on Monday afternoon… it’s completely up to you. If you have a car but don’t need one to get around for work or social activities, then this peer-to-peer rental is a great option for you. Getaround car owners rent out their car, similar to traditional car rental. The service uses the app to lock and unlock your vehicle remotely so you don’t even need to be present to hand off the keys. Renters are limited to a certain amount of miles based on their rental time, so you don’t have to worry about too much wear and tear on your car. The service also provides free driving credit and dedicated parking (in applicable cities) so you can save more, even if you don’t get a lot of customers choosing your car. One of the biggest challenges of living in a large city – particularly if you’re a car driver – is finding parking. Besides the penalizing cost of parking tickets, finding parking sometimes involves driving around the neighborhood for several minutes until a parking space opens up. If you’re lucky enough to have a dedicated parking space, that piece of real estate could mean additional revenue. It’s not uncommon to find garage or parking space for rent signs in trendy city neighborhoods. Now Parking Panda can also help you find people willing to pay money to use your space for an evening, a weekend or an entire month. To get started, you’ll need to set up an account and take a picture of your parking spot, then set your going rate and the availability of the spot. You’ll be notified by email when someone rents your spot. While listing itself is free, Parking Panda takes 20% of each completed transaction. Ridesharing brings up inherent safety concerns for both passengers and drivers, and you should always do your own due diligence before participating.